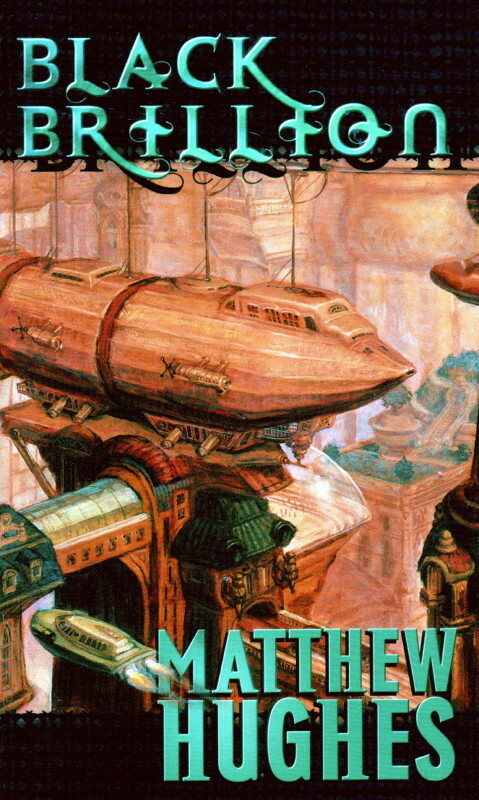 There are many refreshing things about Matthew Hughes’ novels: The old-style galactic empire feel of the setting, and quirky sense of humor he puts into his writing, and even the brevity of his novels, which pack a lot of ideas and plot into stories typically under 300 pages. Template weighs in at under 200 pages, yet it’s not only one of his best, but it’s an excellent introduction to his Archonate universe. Conn Labro is a professional duelist on the world of Thrais, and also an indentured servant on a world where everything is for sale. But when his owner and patron is killed, Conn is bought by an off-world consortium – or nearly so, as a man he’s gamed with weekly for his entire life has also been murdered, and willed Conn enough money to pay off his debt. More significantly, he’s given Conn a bearer chip which seems to be what the assassins are after. Accompanied by a woman from Old Earth, Jenore Mordene, Conn leaves Thrais to learn what his friend really left him, but he also finds the galaxy to be a much more diverse place than he’d ever expected. Template wanders all over the place, and yet it’s a pretty terrific book. Initially I’d summarize Conn Labro as being “a Libertarian Mr. Spock”: His upbringing on Thrais makes him believe that all aspects of human endeavor of transactional, things being bought, sold and exchanged, and that anything else is irrational. Yet every other world is considerably different from Thrais, not least the archipelago on Old Earth where Jenore grew up, which is based around art and lacks monetary currency. Hughes comes up with a nifty way to consider different cultures in the Archonate via a brother and sister who have come up with the idea that every human society is based on one of the seven deadly sins. It’s a fun mental exercise. Conn’s story is his personal odyssey to learn where he comes from (and why that matters), and where he belongs. So he has to grow emotionally to understand how to relate to other people, and a lot of the suspense comes from him making some poor choices along the way. For much of the book he has Jenore to help guide him and inform him, but eventually he has to control his own destiny. Fortunately he’s not without skills of his own (professional duelist, remember?). Overall Template is one of Hughes’ best books, and should appeal to anyone who likes space opera, adventure, or just good old galactic empire science fiction. A visit to a planet where the native life forms are exploited into adopting human archetypes to perform in plays for the human colonists. Being waylaid in a contest with Gabbris and having to take the long way around to reach the finish line. (This is the most absurd story, as Bandar alters parts of his body in comical fashion in each episode, but has the best payoff when he gets stuck in a representation of the eternal war between Heaven and Hell.) You can read this story on Hughes’ web site. Getting caught up in the collapse of an Event in the Commons – which he inadvertently causes himself – and which reveals something hitherto unknown about the Commons. Getting stranded – for reasons I won’t reveal here – as the Helper to a Hero in an ancient scenario of a slaves’ revolt, which leads to a pivotal development in Bandar’s life. As I said, the second half of the book revisits the events from Black Brillion, in which Bandar meets the policemen Baro Harkless and Luff Imbry, and learns that Harkless has an unusual and disturbing talent for entering the Commons himself. Bandar helps tutor Harkless for a while, and then gets caught up in the case the pair are investigating on the wasteland on Old Earth known as the Swept. Here he becomes the Helper to Baro Harkless’ Hero, a key component but ultimately largely a watcher in the younger man’s story. Taken as a whole, some key elements of the novel are not very satisfying: Bandar’s life is disrupted by powers beyond his ken in order to accomplish a goal of great importance to all of humanity, but I don’t think Hughes really sells the manipulation of Bandar very well, and the ultimate goal that he and Baro Harkless manage to achieve just doesn’t feel like the sort of thing that the powers that be would have known about years ahead of time, much less manipulated Bandar to be the right man in the right place at the right time. And as a character arc the payoff for his troubles hardly seems adequate: While he finally achieves something like his life’s goals, he’s lost a big chunk of his lifetime because of his career getting derailed, and he ended up being a supporting character in someone else’s story. I really just felt sorry for the guy. Also, it felt like most of Bandar’s maturation occurs off-stage between the first and second halves, when he’s growing from a young man to an experienced one through the natural day-to-day progression of life; he definitely feels more mature in the second half, but we don’t see it happen, which makes it feel like a big part of his character arc is missing. I think Hughes’ sense of whimsy – particularly the ludicrousness of the situations Bandar ends up in – isn’t as effective here as in other books. Indeed, a problem with both Bandar and Harkless in their respective novels is that they’re both too serious, too humorless, to feel like characters that fit into these situations. While Henghis Hapthorn is himself a pretty serious character, he has both the style and the verbal wit to be an effective actor in ridiculous or belittling situations, in ways that Bandar isn’t. The book is at its best in portraying the narrative potential of the Commons, especially in the first half, which runs through a number of inventive situations, with clever puzzles for Bandar to figure out within the confines of this strange environment. The story involving the war between heaven and hell is my favorite precisely because Bandar takes advantage of the peculiar nature of a scenario within the Commons, and the fact that it’s not a real event, to be able to get out of his predicament. 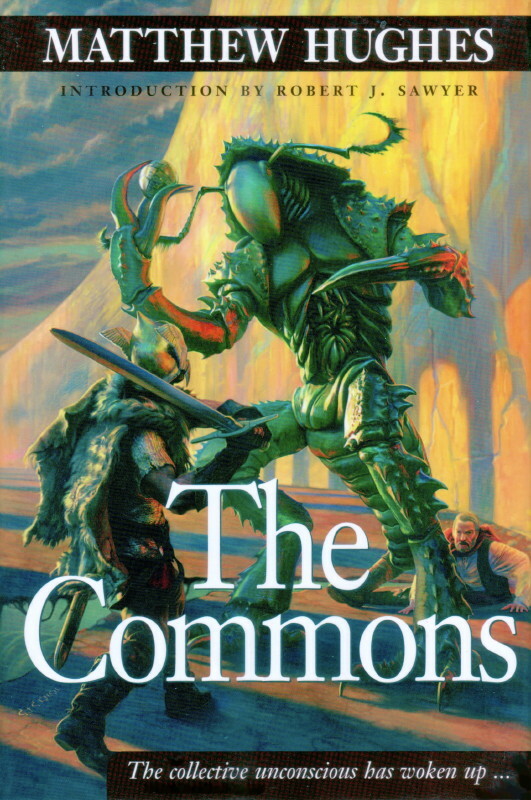 So overall I was disappointed with The Commons; I don’t think it measures up to Hughes’ other novels. I hope he revisits the environment again sometime, but with a story that holds together better. Jogging doesn’t really improve your endurance for sprinting either. Yes, it was another first-frisbee-night huffing and puffing after running back and forth down the field. On the bright side, my forehand throw hasn’t deteriorated as much as it usually does between seasons. Also I completely shut down a couple of faster, taller players while I was on defense (although that’s what leads to the huffing and puffing). I was surprisingly not very too stiff and sore this morning – except for my right heel, which hurt a lot when I put weight on it getting out of bed. It gets better as I use it during the day, but I think I need to get some cushioned insoles for my (new) cleats to try to mitigate this problem. Man, this game sure was a lot easier when I was in my 20s. This week marks I think the third collection of Matt Wagner’s Mage: The Hero Discovered I’ve bought. 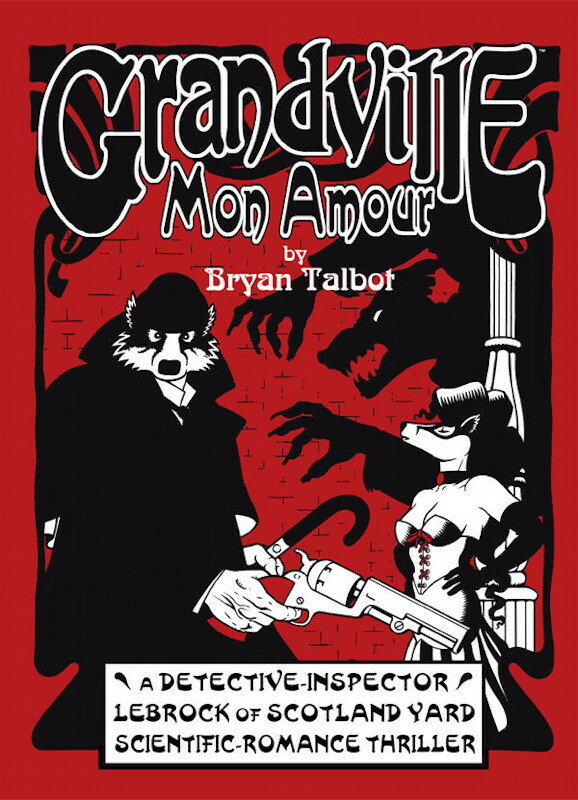 It’s not quite as nice as the 2005 collection, except that that edition contained a printing error (missing text in one of the chapters), which was certainly annoying. So I decided to pick up this one. Now… which one do I keep? Meanwhile, I’m finally all caught up on both Green Lantern Corps and Captain America with the collections out this week. Batman: The Return of Bruce Wayne wraps up a week after Batman actually returned in Batman and Robin. 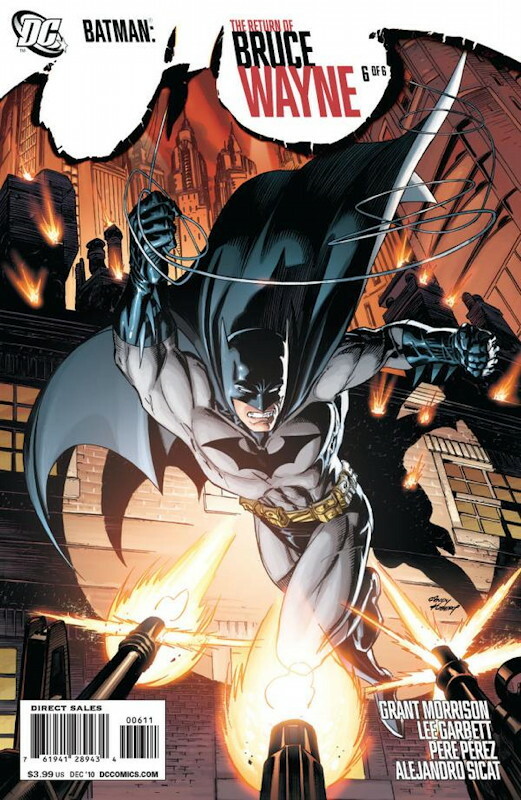 As with most of Grant Morrison’s Batman stuff, it’s so-so. It’s not helped by the uninspired Image-style artwork of Lee Garrett. This whole story has been hamstrung by the overly-convoluted plot, in which Darkseid sent Batman into the distant past, slowly working his way to the present, and pursued by a “hyper-adapter infestation”. First, why would Darkseid pursue such a plan, and why would he use Batman, who he’s got to think is one of the people most likely to defeat his plan? Why not just unleash the creature immediately, and by surprise? Well, one reason is the second problem, which is that the creature doesn’t seem so tough, since Superman, Wonder Woman and Green Lantern wrap the thing up, stuff it into a time sphere, and send it off to oblivion. Weak stuff, especially since it’s not clear the thing could have gone toe-to-toe with any of that trio anyway. Morrison was once a writer who – despite his flaws – produced some ground-breaking stuff for DC. While I wasn’t a fan of every bit of it, Animal Man, Doom Patrol, The Invisibles and JLA were all key comics for fans of their day who wanted more than routine superhero fare. 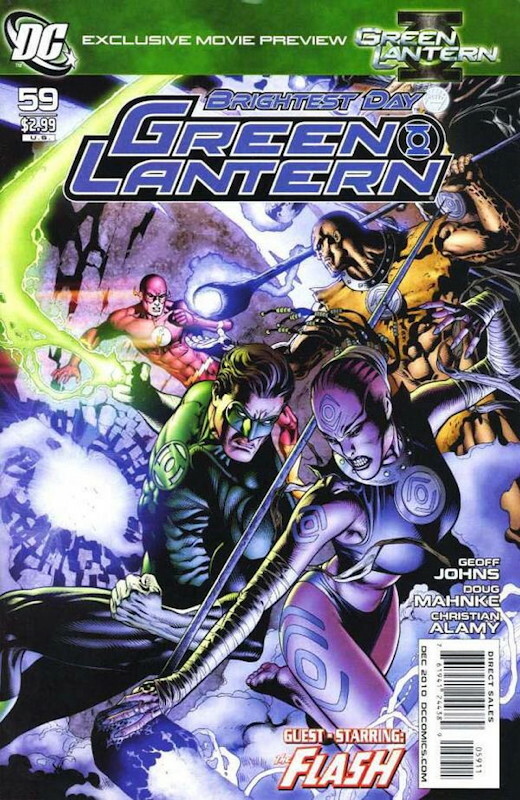 But JLA seemed to have made more of a mark on Morrison’s writing style than the other way around, as Morrison’s work over the last few years has been only a little more than routine superhero fare – slightly unorthodox in its style, but when he went farther than that it produced the basically-unreadable Final Crisis. So all of this raises the question: What is Grant Morrison really accomplishing at DC comics, for the readers? Honestly Geoff Johns’ Green Lantern work has felt more inspired and coherent than Morrison’s Batman and related titles. Maybe Morrison is a huge Batman fan and is having the time of his life writing the character, but I don’t think it really shows in the final product, which has been uneven at best. At this point I think I’ve long since gotten the idea of what Morrison is doing here, and it’s not doing much for me, so as I said last week I think this is it for me with Morrison’s mainstream DC titles. Maybe I’ll check in again when he seems to be doing something different again. The second issue of Knight and Squire is so much better than the first that I wonder why Paul Cornell decided to lead with the first issue at all. 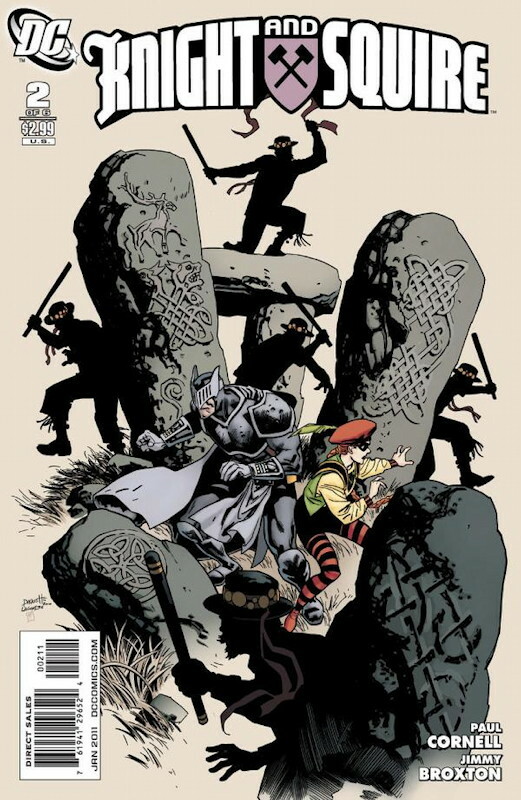 This one is a much better introduction to the characters: We already know they’re a Batman and Robin type of duo, but we see them operating in their hometown and how they relate to the locals (it’s cute and clever, really), and then they face off against a group of evil Morris dancers (no, really). It’s not a profound story, but it’s fun and funny and the right amount of ridiculous. I hope the rest of the series is more like this issue. I’ve always been unaccountably fascinated by the T.H.U.N.D.E.R. Agents, a team of superhero-secret agents from a small publisher in the 1960s. The original series was not much to read compared to the typical Marvel Comic of the era, but they did have first-class artists (Wally Wood, Gil Kane, Steve Ditko, etc.). 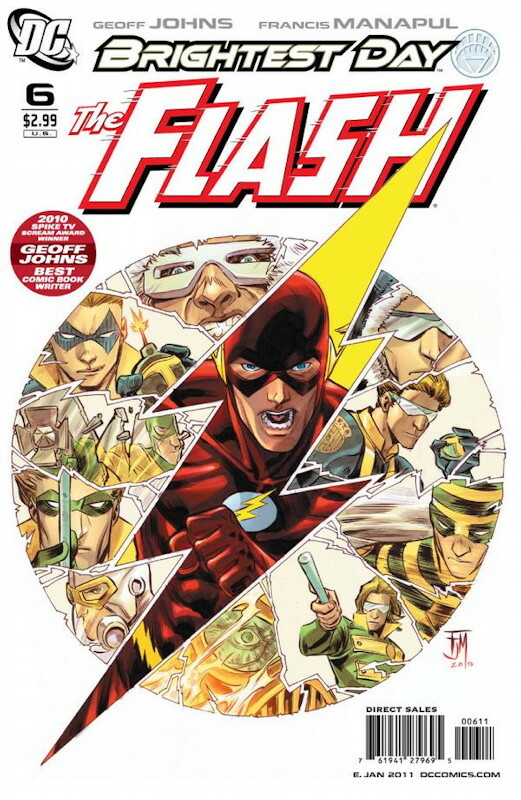 What hooked me was the short-lived series from Deluxe Comics in the mid-80s, which not only had true top-notch art talent (George Pérez, Dave Cockrum, Jerry Ordway, and unfortunately Keith Giffen at his artistic nadir), but also outstanding writing, highlighted by the characterization of Lightning, whose speed suit causes him to age rapidly, and after just a few years of use he’s now an old man. Unfortunately that series came to a premature end because Deluxe though the Agents were in the public domain, when in fact they were not. The owner (the late John Carbonaro) licensed the character to a couple other companies, but none of them really took off. 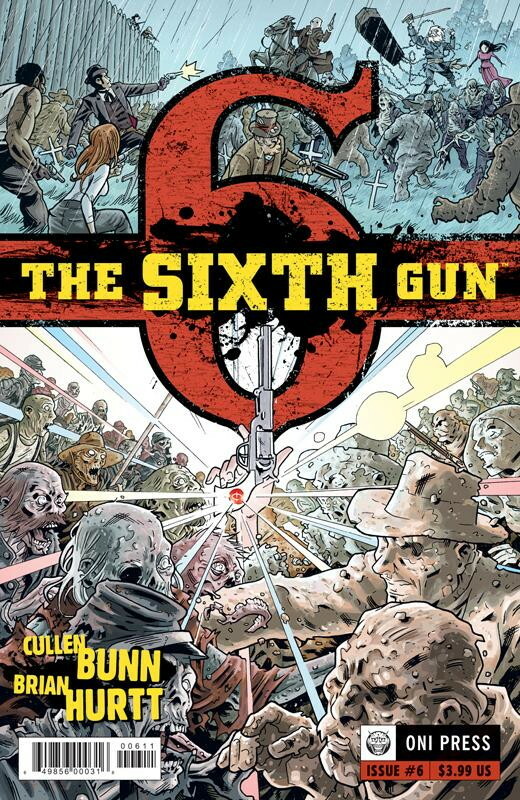 Now, after the success of DC’s Archives collections of the series, DC is publishing a new series, which apparently has no continuity relationship to the earlier series. 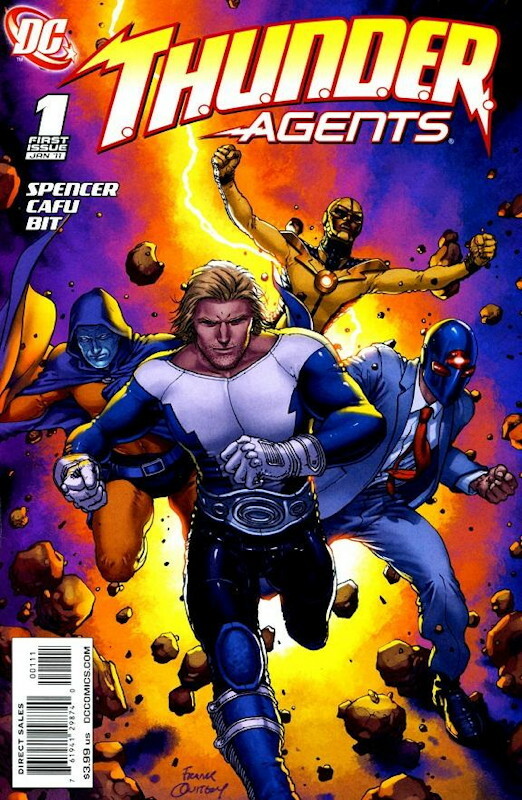 This series is taking the Lightning angle and running with it: Using any of the Agents gear causes its wearer to rapidly burn out, much like the premise of Marvel’s 1980s series Strikeforce: Morituri. (I wonder if writer Nick Spencer realizes the resemblance?) 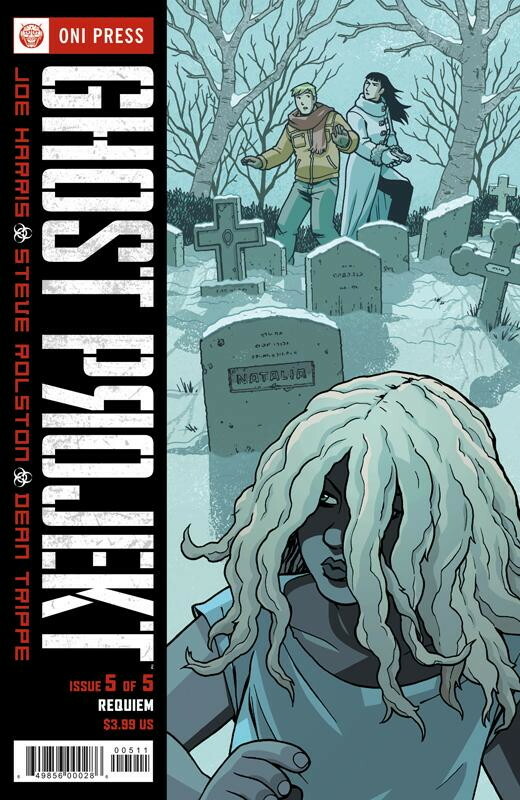 The first issue is pretty good, and suggests that it’s going to be more of an espionage play-and-counterplay story with overtones of superheroics than the other way around, which could be interesting. The art by the single-named artists Cafu and Bit is quite good, strongly resembling that of Paul Gulacy, albeit with less use of shadow. I doubt it will ever replace the 80s series in my heart, but it’s got promise. It’s pretty hard to write a “end of the age of superheroes” story, especially one deploying the usual Justice League/Avengers paradigm as the team of protagonists. Bill Willingham’s Pantheon (which I liked) took a “if the heroes win” approach, while Rick Remender’s The End League (which I didn’t) took an “if the villains win” approach. 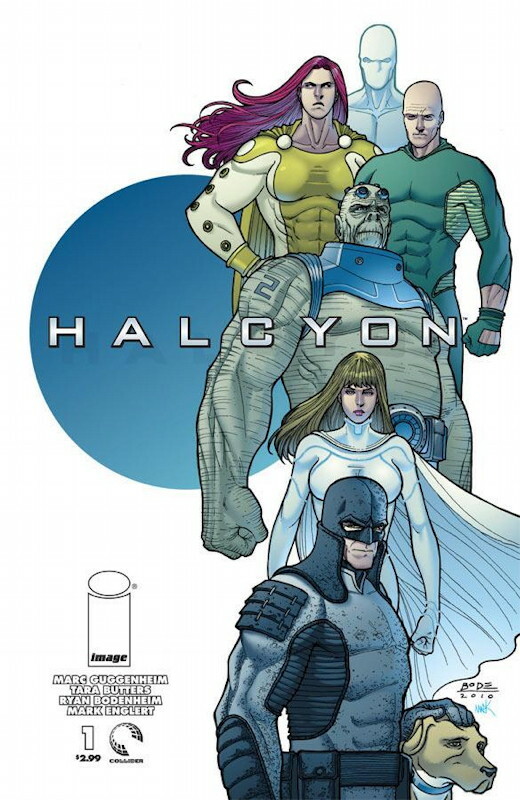 Now Image is publishing Halcyon, in which Marc Guggenheim and Tara Butters seem to be taking an “all the villains stop being villains” angle (with the possibility that it’s actually a devious villainous plot). The series are immediately nervous that they’ll be rendered redundant (because, after all, what fun is it to be a superhero without supervillains to beat on? ), but maybe I’m reading too much into it: This first issue is really just the set-up, with some foreshadowing, and it’s pretty well done. Certainly good enough for me to stick around for a while to see where it’s going. The art by Ryan Bodenheim is pretty erratic. His style seems inspired by that of early Doug Mahnke, maybe with a little Frank Quitely. His layouts are pretty good, but not very dynamic. The darker characters are rendered better than the purer hero types. And his anatomy, especially of the women, seems a little off to me. On the other hand, he seems to have talent and everyone has to start somewhere (he’s drawn a few other things over the last decade, but this is my first exposure to him), so maybe he’ll develop. I’m working my way more-or-less backwards through Matthew Hughes’ tales of the Archonate, his far-future galactic society which is marked more by his own wry and whimsical turn of phrase than anything in the setting itself. Black Brillion is the tale of Baro Harkless, rookies member of the Scrutinizers (or “Scroots”) who follows the con man Luff Imbry as Imbry tries to pull a job in an unusual city on Old Earth. As is Hughes’ tendency, the opening sequence is merely a lead-in to the main story (not unlike the pattern in the James Bond movies): Baro’s success in arresting Imbry and others leads to his being instated as a full officer, but his boss, Ardmander Arboghast, quickly sends Baro off on a new assignment with a new partner – Luff Imbry, himself now a fully-deputised Scroot. Their mission is to capture another con man, Horslan Gebbling, whom Imbry once worked with, who’s apparently working a scheme to separate sufferers of an affliction known as the lassitude from their money, claiming to be able to cure them while on a voyage across a wasteland known as the Swept. One of their fellow passengers is a an named Guth Bander, a Nöonaut, able to enter the Commons, the manifestation of the collective unconscious of mankind. Baro finds himself intrigued by the notion, and even finds that he has an unusual talent for entering the Commons, drawn by the archetypal entities that dwell there into accomplishing some task. All of this greatly alarms Bandar, who is keenly aware of the dangers in the Commons and in interacting with the archetypes. Baro finds himself torn between his mission – and following in his father’s footsteps – and his sudden new calling in the Commons. The plot itself is both interesting and peculiar: The pursuit of Gebbling develops into a much more serious scenario which threatens all of Old Earth itself, and that Hughes makes this transition naturally is impressive stuff. On the other hand, the introduction of the Commons and the degree to which it dominates the second half of the story is a very strange departure from the straightforward police investigation the book starts out as. It feels like a big distraction until it ends up playing a key role in the resolution of the case. It makes the book feel like a bit of a patchwork, though, but the focus on Baro’s feelings about his father and his efforts to find where he belongs in life makes it work in the end. While not as ambitious as Hughes’ later novels starring the detective Henghis Hapthorn, Black Brillion is still a fun romp. 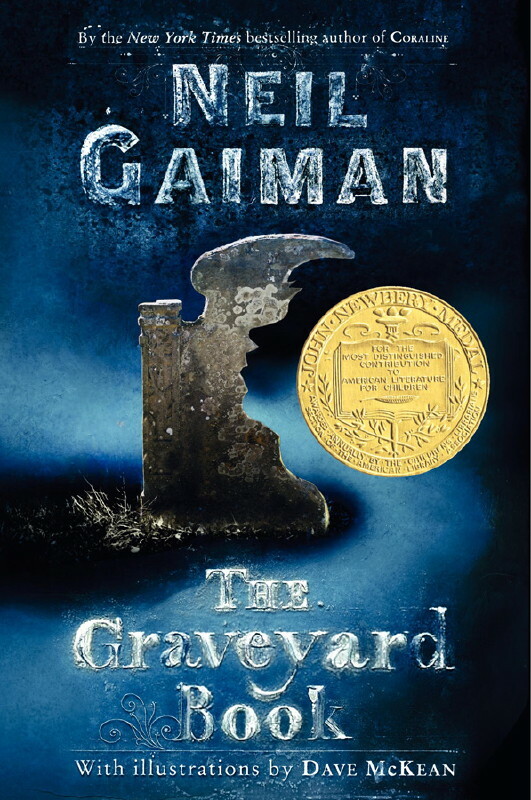 (Although the title bears only a passing resemblance to the story; perhaps not the best choice for the book.) Overall this is actually a fine introduction to Hughes’ Archonate universe, and his writing style overall. We had a nice quiet weekend, highlighted by joining our friends Lisa and Michel and their daughter for lunch (after Lisa and Debbi went shopping). I have this bizarre ability to charm young kids (“cats and small children love Michael”, says Debbi), and their daughter is apparently always excited to see me. I think Debbi feels a little left out sometimes. Sunday I was feeling a bit blah all day. Maybe because it was raining, even though I usually like the rain. Or maybe the time change threw me off. I’ve started running again now that biking season is basically over, so we got up and jogged a mile and a half (people who follow me on Twitter or Facebook are probably well acquainted with my running progress and lack-of-prowess). After running errands in the morning we stayed inside and watched football for the rest of the day, catching up on a few things around the house. Though we forgot to do a few chores in the bedroom (rotating the mattress, painting over the holes from the mounted shelf we moved last weekend). Maybe next weekend. For dinner I grilled hamburgers, and of course the rains returned for exactly the span of time I was grilling! I’ve actually been very busy lately but have not felt much like updating. My plan is to push through some accumulated book reviews (sorry, everyone who can’t stand my book reviews) and then do some shorter-but-more-frequent updates on other subjects.